My office at work is a decent office; I have no complaints. It’s a 10-foot square, with enough room to accommodate a narrow coat closet, a credenza with file drawers, a desk, two visitor chairs, and a four-shelf-bookcase. And it has a window. A closed-door office with a window is a big deal and, to those in the know, immediately communicates a certain work grade level. I keep the blinds on the window mostly closed. When I first moved into the space, the window overlooked the smoking area. You had to stand and then look at an angle to get a better view. Later the smoking area was confined to a covered patio-like area on the other side of the building, but I still have to stand up to see something other than another part of the building. Work space can be important, and in large organizations tends to follow whatever management theory is in vogue at the moment. In the 1940s and 1950s, big open spaces were all the rage, especially in functions like finance and accounting. The 1960s and 1970s brought a lot of enclosed offices; my first job at a large corporation in Houston found me in an 8×12 office that had a large storage closet. Things changed in the 1980s and 1990s, and cubicle farms could be found all over. In my workplace today, we have a mix of cubicle farms and regular offices. Language is spoken and written in work spaces. Ideas are communicated, sometimes well and sometimes not. Conflicts and problems arise and are resolved, are left to fester or ignored. People (adults and children) are encouraged, reprimanded, lauded and belittled; people create and perform; people manage and survive and flourish and wither, whether the space is the Oval Office in the White House, an office cubicle, a classroom, a home, the cab of a truck or taxi, a warehouse, an assembly line, a hop or a store, an offshore oil rig or a hair salon. Emotion happens in these workplaces, dramas and comedies and sometimes tragedies. It is life, work life. And this is the stuff of poetry. upon screens and minds and hopes. Observe the space you work in. No matter how simple and plain or how complex and luxurious, it contains poetry. Can you find it? 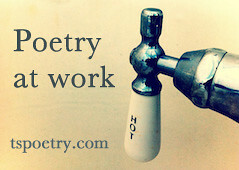 If you can find that poetry, write a poem about your work space. Post it to your blog (perhaps with a photo) or post in the comments section here. The definition of “work space, ” like the definition of “work, ” is wide open—because work happens everywhere. We’ll select a few to feature here and on the Tweetspeak Poetry Facebook page (and you’re welcome to post your poem there as well). Top photograph by striatic. Sourced via Flickr. Bottom photograph and post by Glynn Young, author of Dancing Priest. 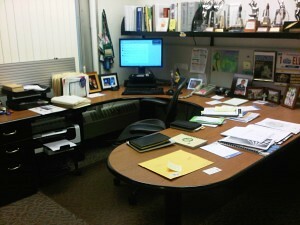 And yes, that is Glynn’s office at work. A poem about where we work . . . Glynn, you have thrown down the gauntlet :). Let me ponder that for awhile. 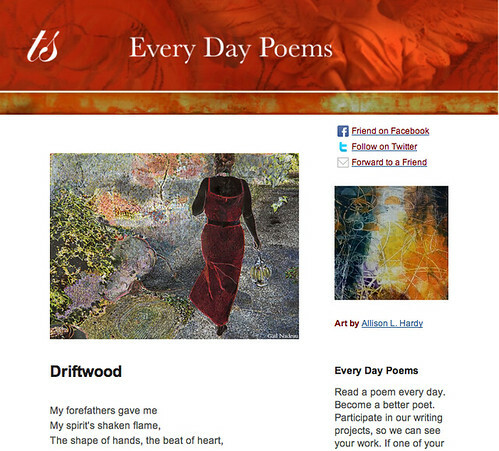 In the meantime, know that I loved this post and your poem here. Your working space looks very inviting, too. Do you have an Aeron chair? What are those images that “stare, in framed silent witness”? The photo doesn’t show the two walls covered with pictures — big photographs, a framed poster, a print of Stump Speaking by George Caleb Bingham, the Gettsyburg Address and a few other things. And yes, I do have an Aeron chair. With apologies to Ralph Kramden. . .
keep it down. Rain brings out the worst. Bad weather guarantees bad hair days. change; you do it when nobody’s looking. and I don’t give out transfers.
. . . how to brake. . . .